Many senior and geriatric cats have a difficult time navigating the deep sinking, sandy material we know as cat litter. When little hips and knees do not work so well one can only imagine how challenging it can be to navigate quicksand every time you eliminate. Think about that for a minute. How many 80 year old humans go for strolls on the beach? It can be equally as tough for your 16 year old cat! 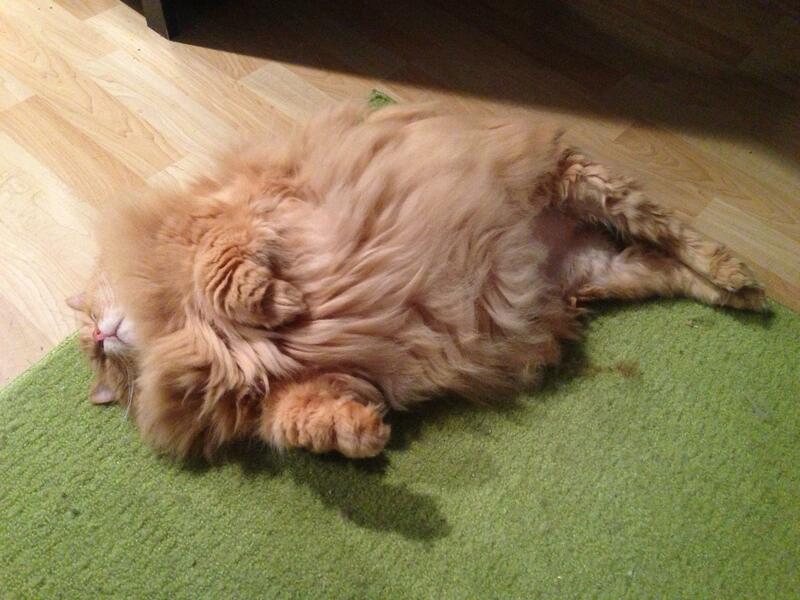 This is why so many senior kitties start eliminating on carpet or hard flooring. They are seeking ground that does not move out from under their feet and is easier to navigate! 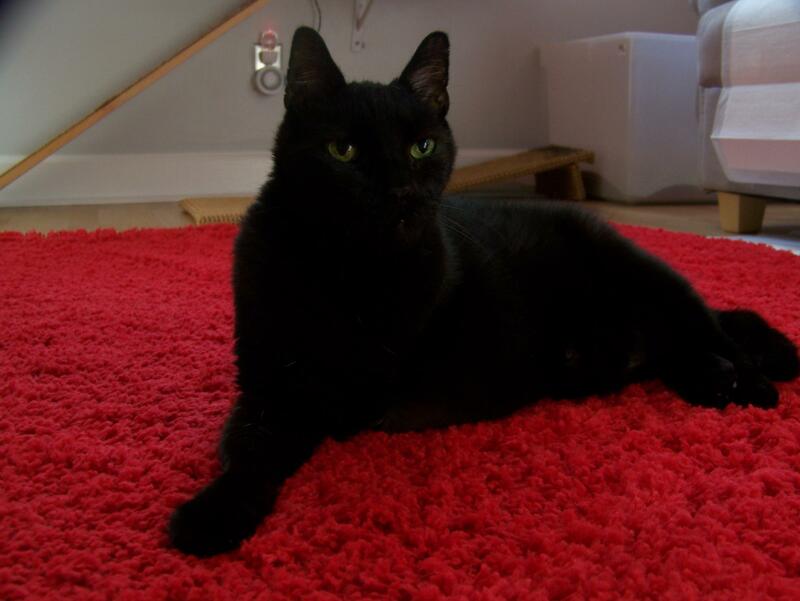 Carpet is also nice and absorbent and often always clean. 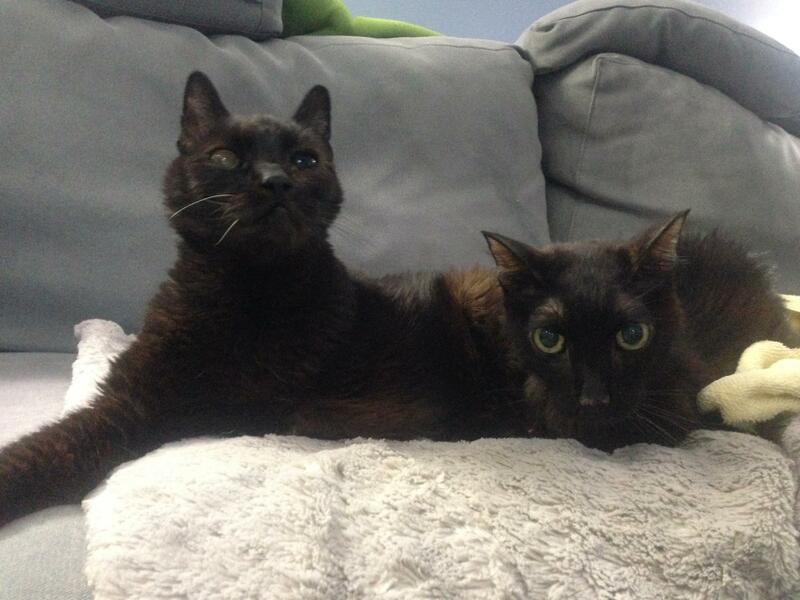 It is easy to get frustrated, even mad at our cats who may be missing the litter box in their senior years but these cats simply need our help succeeding. We make accommodations for humans such as rails to grasp near toilets and we downsize to efficiency apartments or a ranch-style home with no stairs. 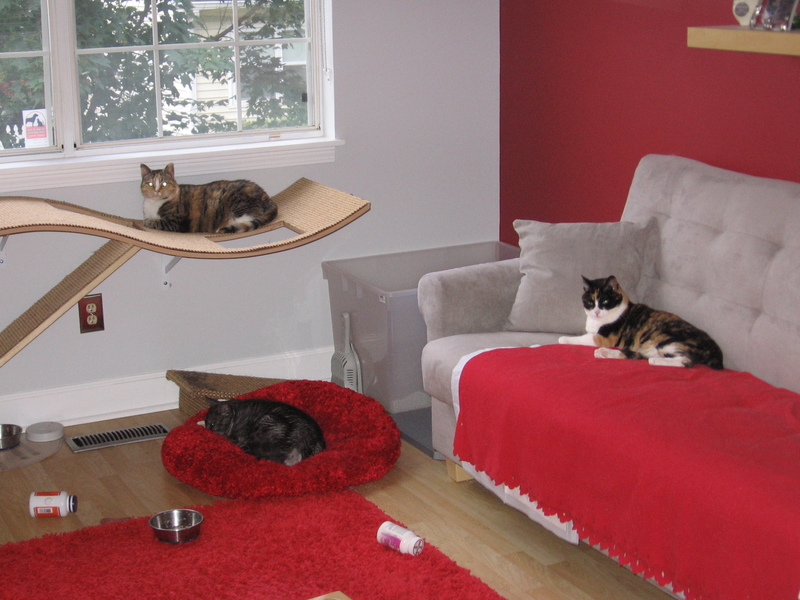 I am suggesting that we use some creativity to better help meet the needs of our feline friends in their golden years. Handicapped, or handicapable cats as I prefer to call them, those recovering from injury or surgery and special needs kitties also often require special accommodations. Cats that have been hit by a car and now do not have full use of their limbs can lead a full life, but they need some extra help. In the info that follows I explain the challenges of a few special needs kitties in my life, how we accommodated them to allow them independence and dignity and I hope to illustrate to you how they thrived despite it all! We call these her Barbie fashion splints! Contemplating ascending stairs -quickly thwarted! Non-slip mat beside water bowl for easy access. 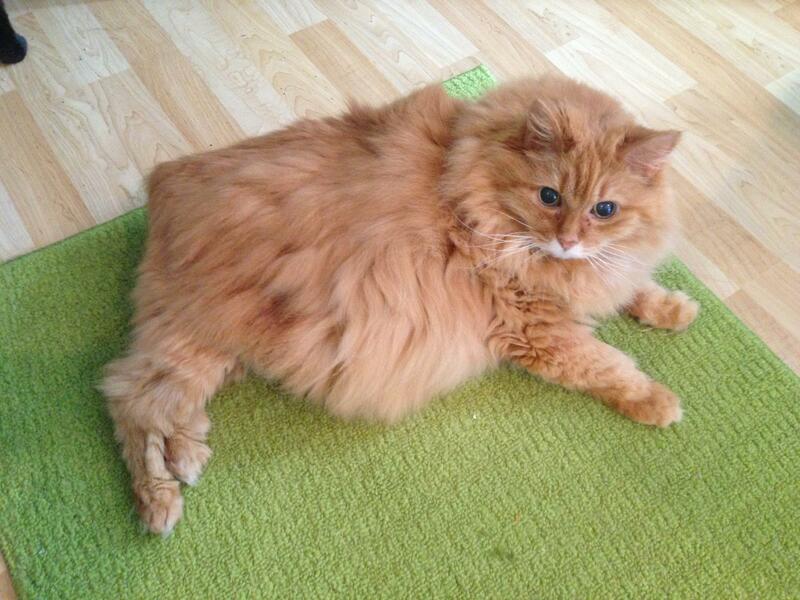 Peaches is 15 years old in these photos. She had been having some soft stool and as you can imagine due to her roundness she could not easily reach to clean herself up. I gave her a bath as I had done about 2-4 times a year her entire life. This bath was different. She hopped and jumped quite a bit to exit the tub. When we were done I set her down and realized she was unable to walk. 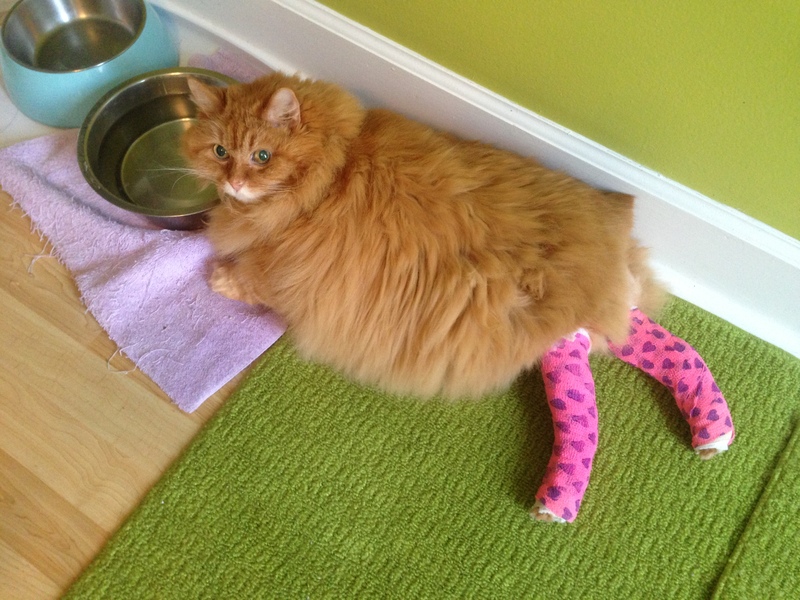 The veterinary orthopedic surgeon said she had, "blown out her hocks" a.k.a. her ankles. She was unable to stand at all. It was awful. So for the next 8 weeks this little lady wore double hind leg splints! Believe it or not as long as she was on texture she could walk. Towards the end as she improved she was even able to get in and out of the large storage tub litter boxes! Right: Machine washable non slip mats for traction. Two shallow litter pans to ease her ability to enter and exit: one with only a 1/2 inch of non-clumping clay litter and one with a puppy pad. Regular litter box should she choose to use it and of course food, water and litter all close together to make it easier for her to access. These are the times where separating food and water and making them work for every bit they get goes out the window! 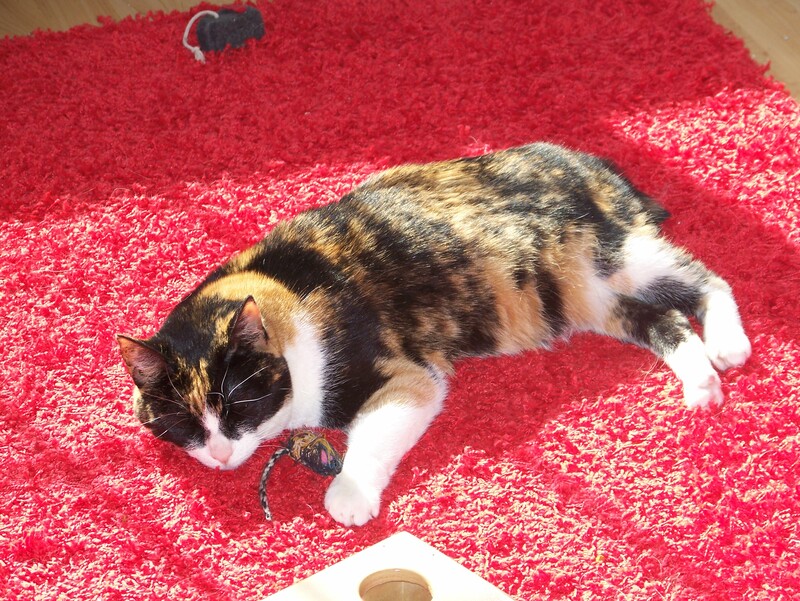 Plush bedding and catnip toys as well of course! This second picture illustrates how we created a superhighway for Peaches so she could get to all of her favorite spots in the house all on her own. We made a sidewalk out of non-slip mats from Ikea! A view of her many accommodations. Turning hard floors into traction highways! Up and cruisin' in her splints! In-between splint changes - still foraging! Peachy Cobblers made a full recovery. The goal is to be able to provide and meet your cats needs while containing mess to make things easier for you, the human. It is also imperative that the cats are able to maintain quality of life, have independence and go about their normal routines as best as they are able. 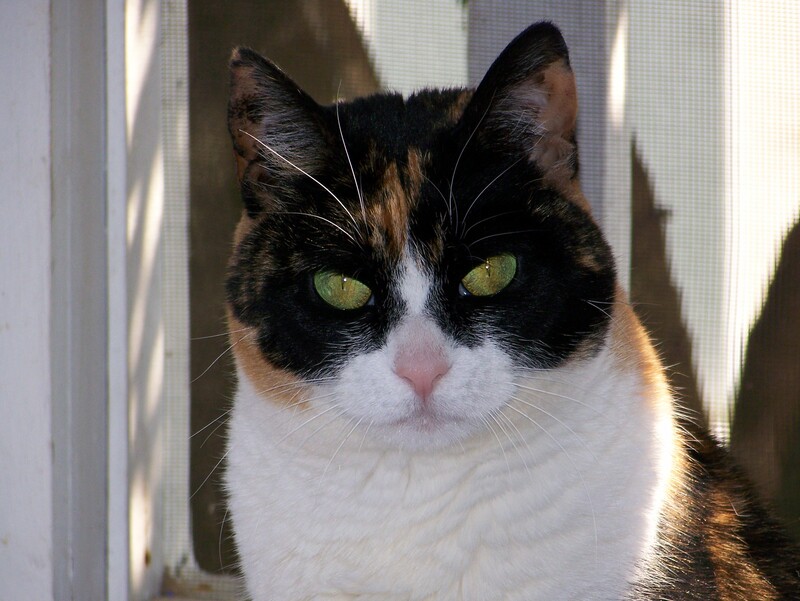 While sometimes confinement is necessary, especially during surgical recovery, it should be avoided for chronic conditions such as arthritic older kitties or what are they living for? Spending their last few months locked up alone in a bathroom is not quality of life for anyone. 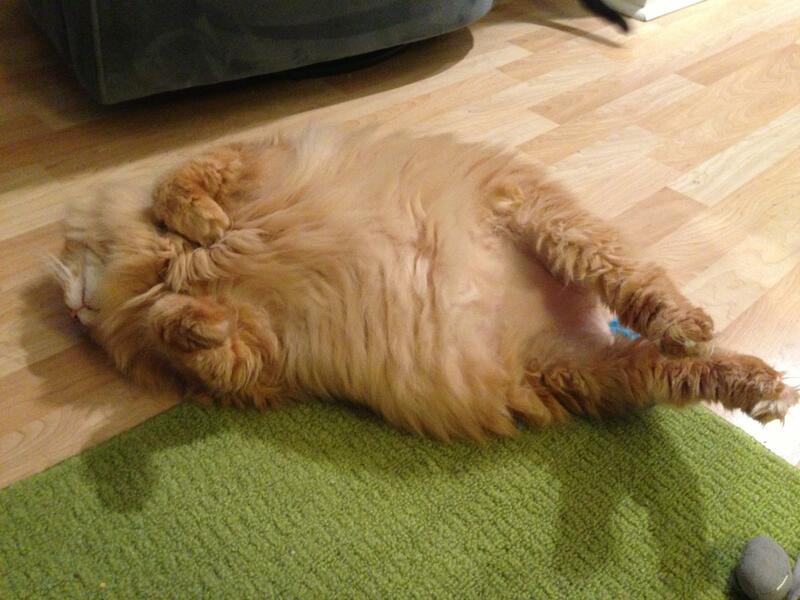 Which bring us to our next example of broken felines! 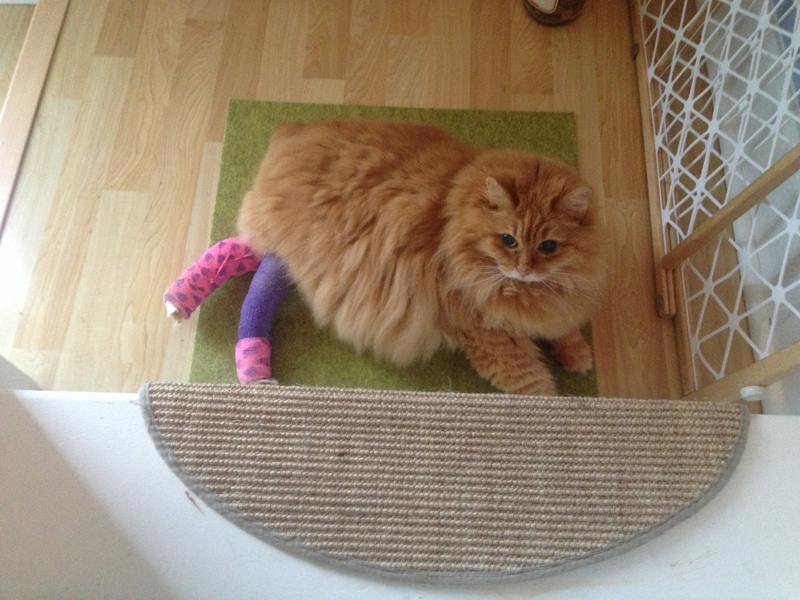 Right: normal scratching behavior after splint removal. 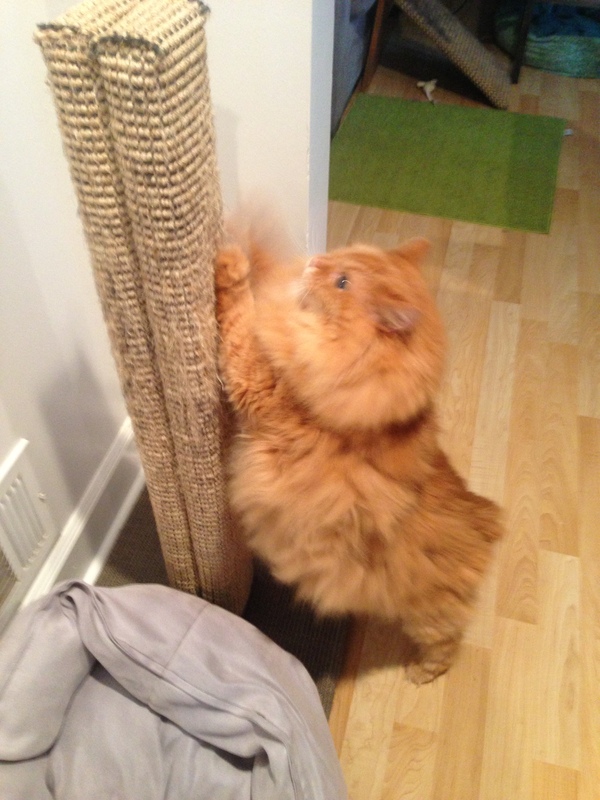 Remember that scratching is a "feel good" behavior, so when you see cats scratching that were sick, you know they are feeling better! This was a proud day! The goal is always quality of life. Here you can see we created a safe bathing station so that no one had to be submerged in the bathtub ever again! 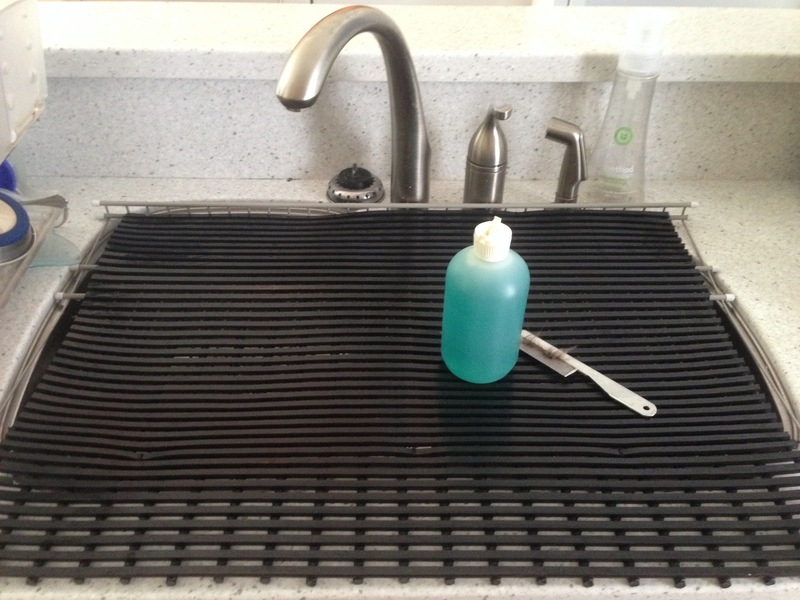 Using vinyl coated closet shelving zip-tied to a rubber slatted mat we fashioned this to cover our kitchen sink. This way the cats can get cleaned up using the sprayer and the water and soap can easy drain through. They can choose to stand or lay down. This made it so much easier to help keep the old guys clean after accidents. Lefty in all of his hit by a car tripod awesomeness. They were our matching set for 15 years. 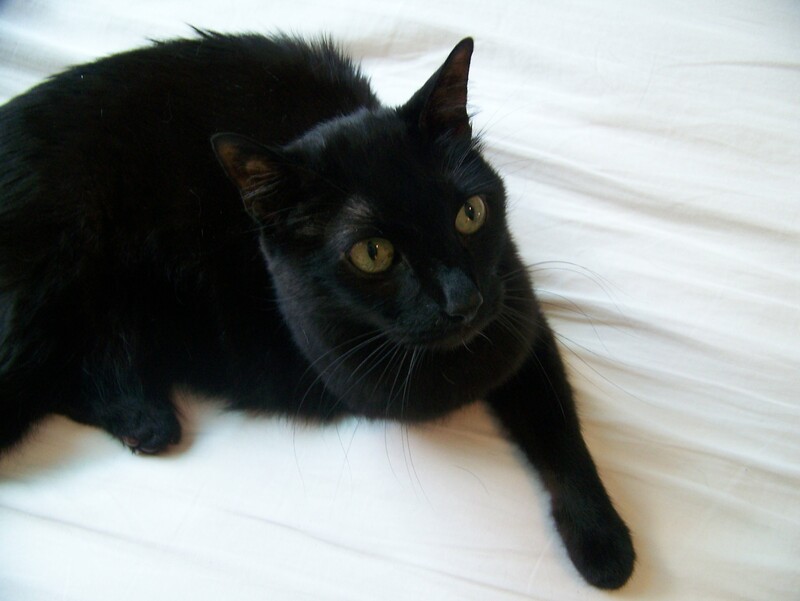 Vader lost his right front leg to cancer at age six. I have been known to say that 4 legs are "extra." 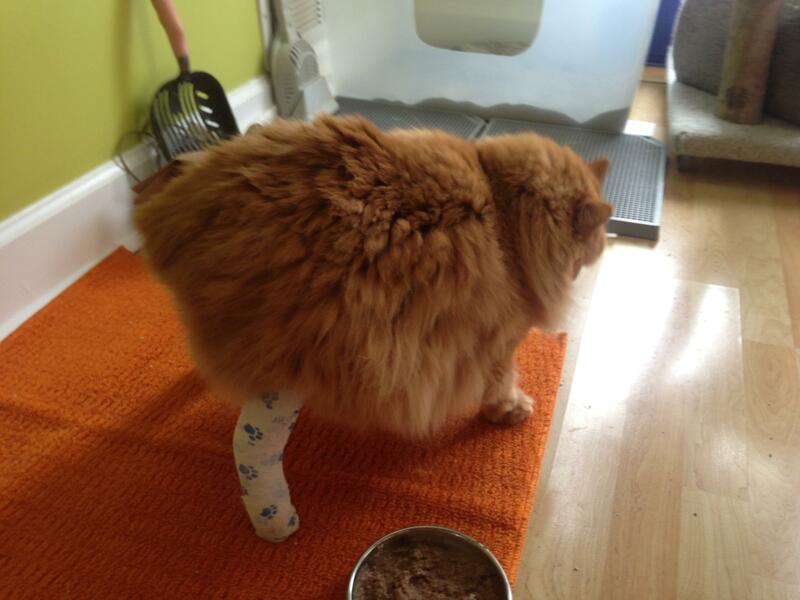 Cats are amazing at going through life as tripods and their resilience and ability to overcome is second to none. However, when they become geriatric you realize just how much they do need all four legs, much more so than they did as youngsters. My best advice, start joint support early and keep them thin so they do not have all of that extra weight to carry around. As the years progressed we had to modify more and more. Initially, simply cutting the large storage tote litter boxes down extra low was enough to ease their ability to access the litter. This of course meant more litter scatter and tracking mess but that was a small price to pay to allow them dignity and independence. Large storage tote litter box cut extra low to ease entering and exiting the box. 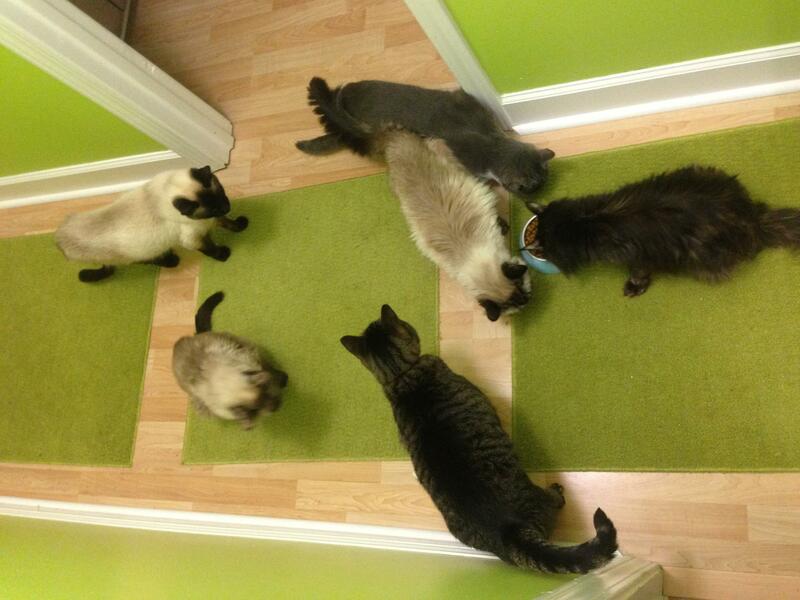 Shallow amount (~ 1-1/2") of litter so the cats do not sink as low and do not have to work as hard to move around. Step out mats with puppy pads underneath to catch any overshooting from the box. 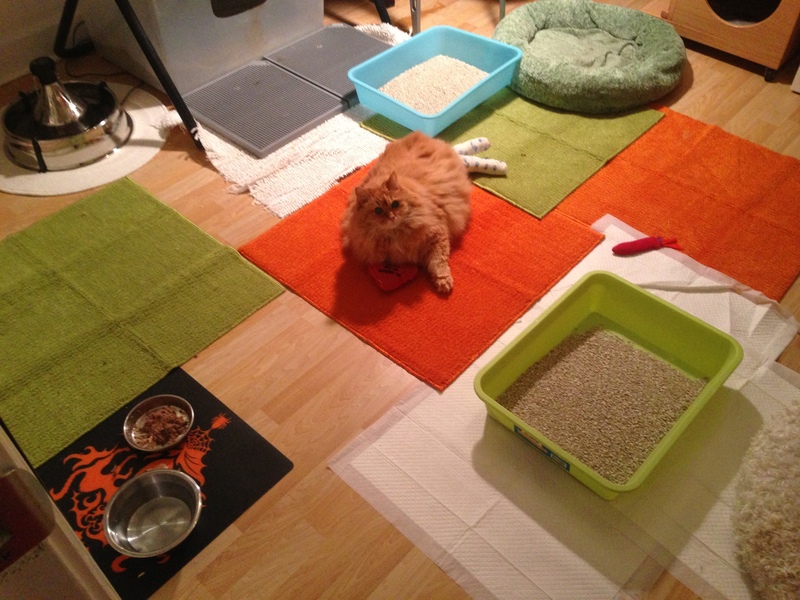 It is important to place the pad partially under the litter box and partially under the step out mats for maximum urine collection. 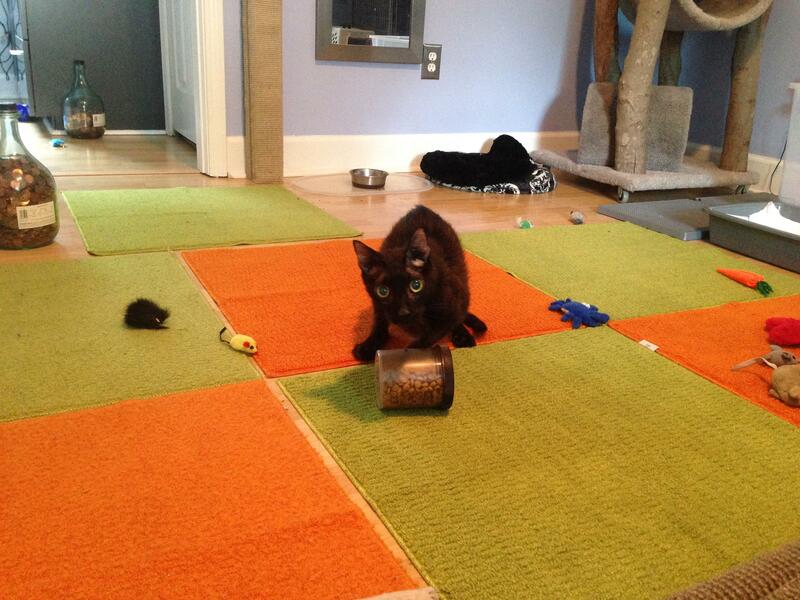 Arthritic cats cannot squat as low so they often eliminate over the sides of the boxes by accident. These step out mats were also perfectly acceptable elimination locations in my opinion. If they chose to pee on the step out mats I saw this as compliance. You must have realistic expectations! 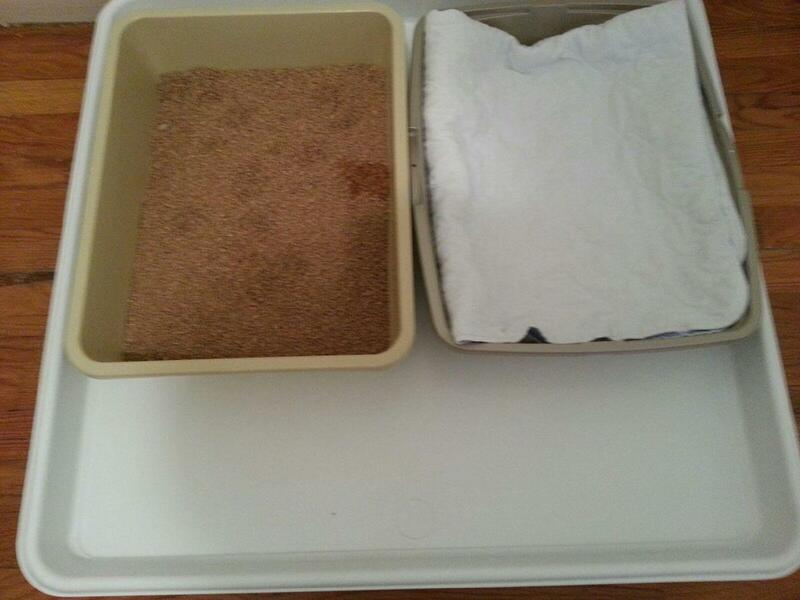 Shallow puppy pad box offered beside litter box as a soft and absorbent option. Puppy pad use, whether in a pan, on the floor, etc. is also compliance. 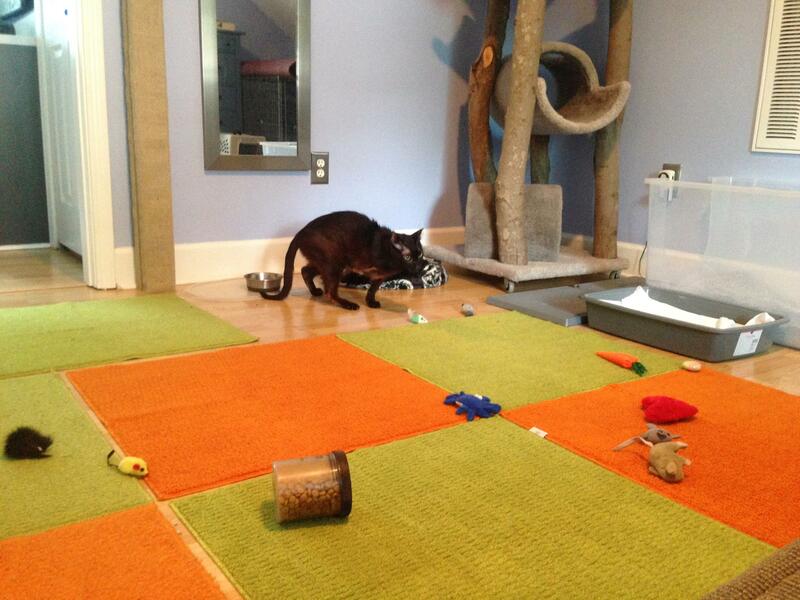 Whatever is easier for the cat to use and still easy for the human to clean up can be an acceptable alternative. 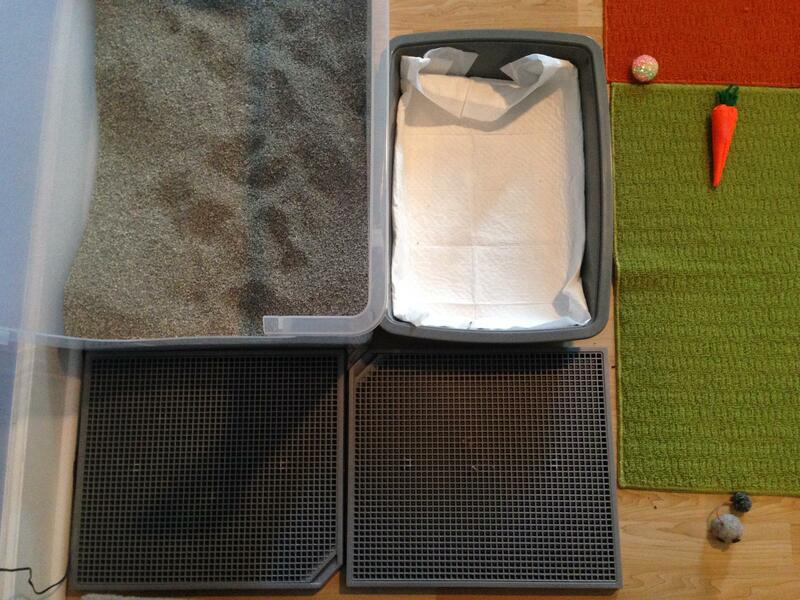 A view of the whole set up & the washable mats for traction & easy clean up! Still foraging at 15 with only 3 legs! Vader had another special need. He had asthma. For those of you that have been following along regularly for years you may recall that Vader is the cat that saved our home from burning to the ground when it caught fire. You can read Vader's heroic tale here. In his later years he would, quite sadly, cough so hard sometimes he would "pee his pants." He couldn't help it and he did have bladder control, he would just have coughing fits and urinate. And yes, of course he was on medicine for his asthma! 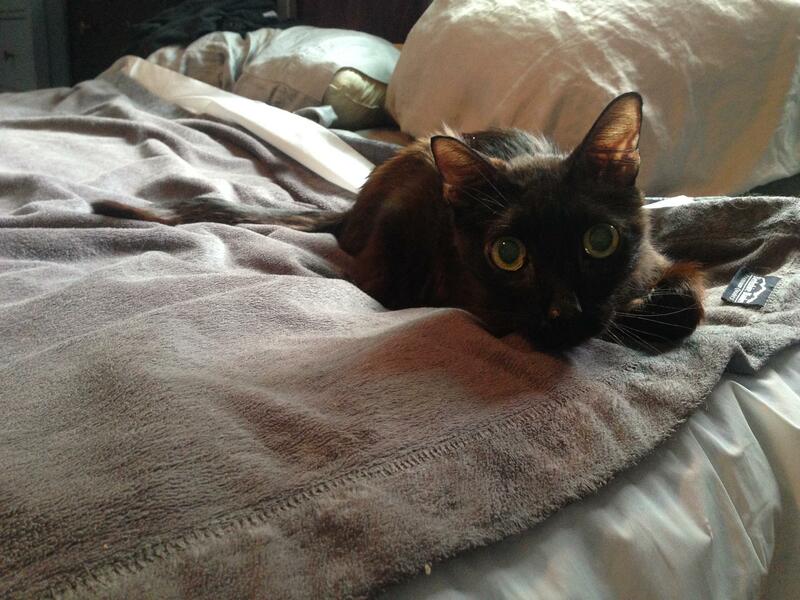 You can imagine the dilemma in that Vader's favorite place to be was on our master bed! The photos below show how we managed the problem. Each morning we would make the bed, cover it with an inexpensive shower curtain liner and then a washable, soft, fleece throw. Vader could still have his favorite spot, he was still comfortable, but our bed was protected. How could we possibly confine him away from the bedroom after all he had done for our family? 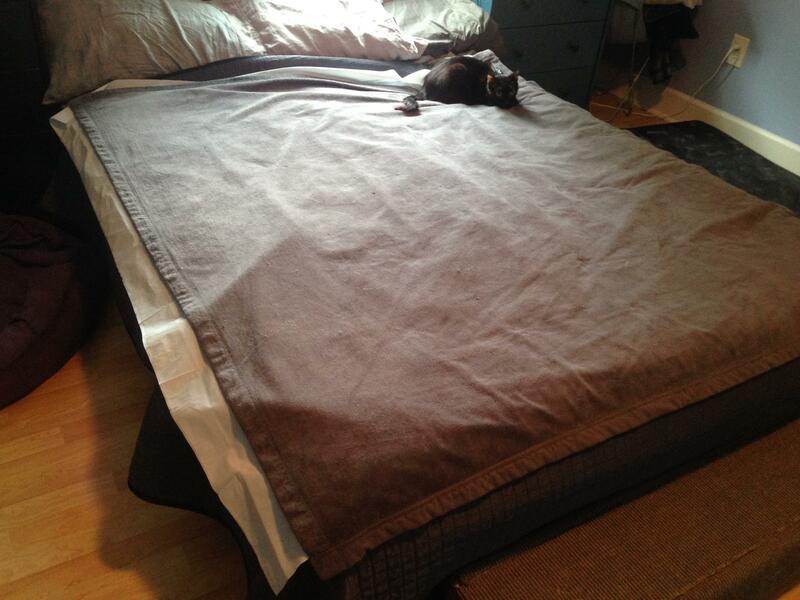 Similarly we would cover cat beds with a puppy pad and then lay machine washable towels, blanket etc. on top for maximized coziness. This did wonders for salvaging our pet beds. 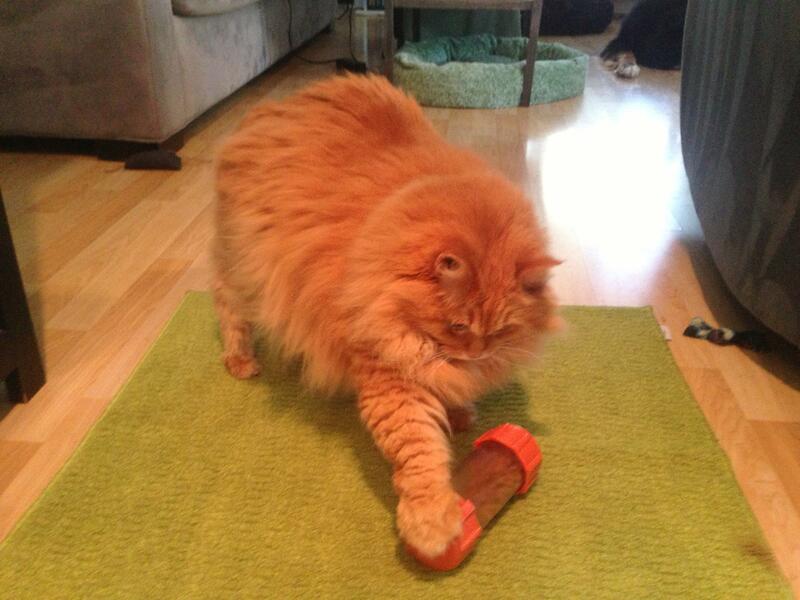 This is also a great trick for many old cats for a myriad of reasons. You can allow your seniors to enjoy their favorite napping spots by placing puppy pads on chairs or sofas with an attractive throw over top to protect furnishings from vomit and other accidents. An appreciative boy still sleeping in his favorite spot. The bed covered with shower curtain liner as described above. 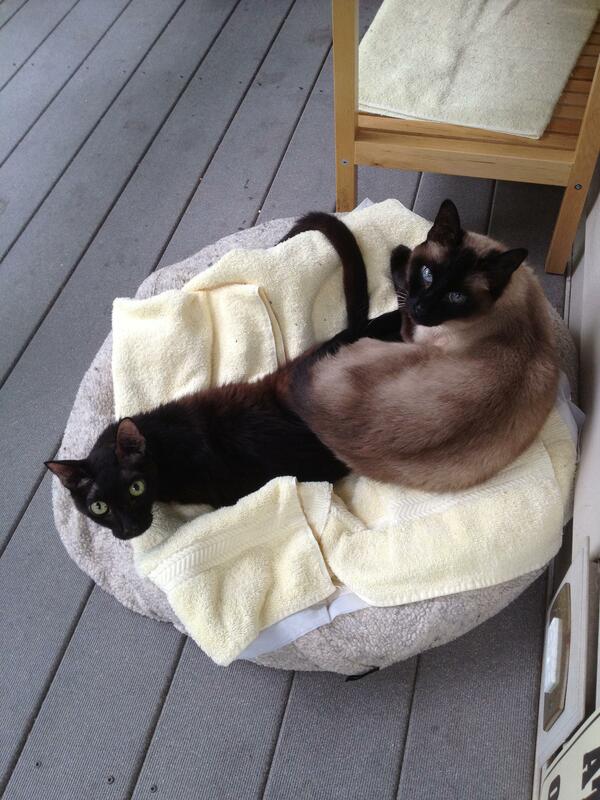 Vader with littermate Simon on a puppy pad covered bed with towel over top. One of my all time favorite litter pan alternatives is featured here, an under the washer/dryer drip pan available at your local Home Depot or Lowe's. These are shallow, huge and easy to navigate. They can be used on their own or combined to create options as shown here. They can be offered with litter, shredded newspaper, shredded paper towels or just plain. Great for arthritic old seniors too! Cats like Wheels can often scoot themselves into a box to eliminate, but what they will prefer to eliminate on will be different for each individual. 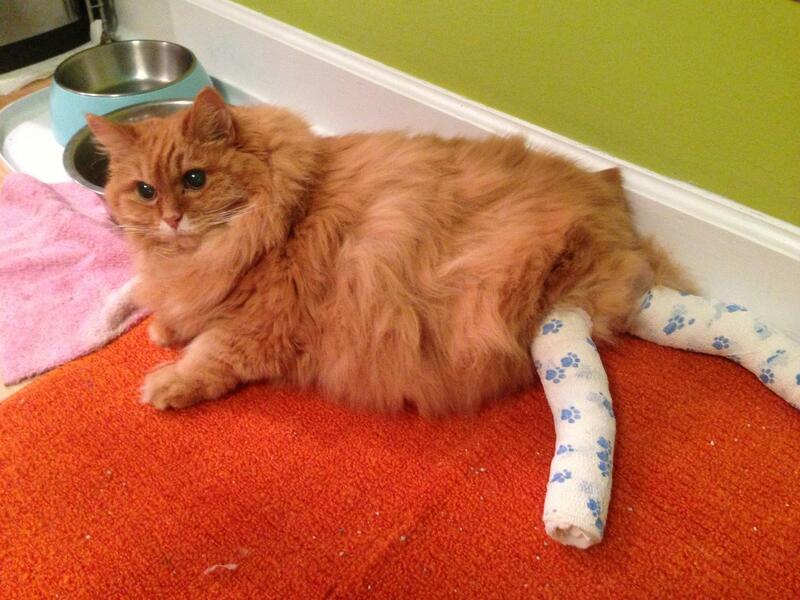 Also, some handicapable cats can get around better than others. 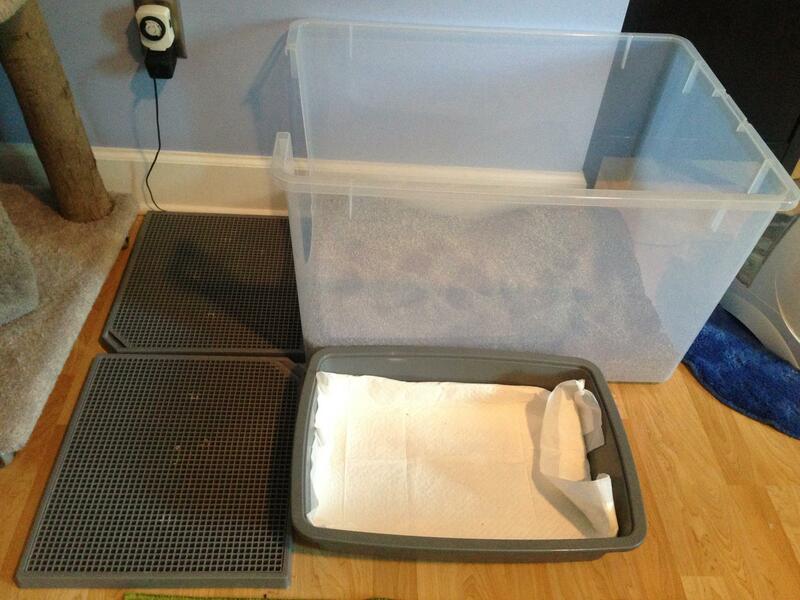 Litter may be too messy for some so a puppy pad option as shown here can used instead. It is soft and absorbent and will help keep the kitties clean. Able to get up and down off of sofa all by herself! Euthanize? I think not! As you can see here Wheels could get around. 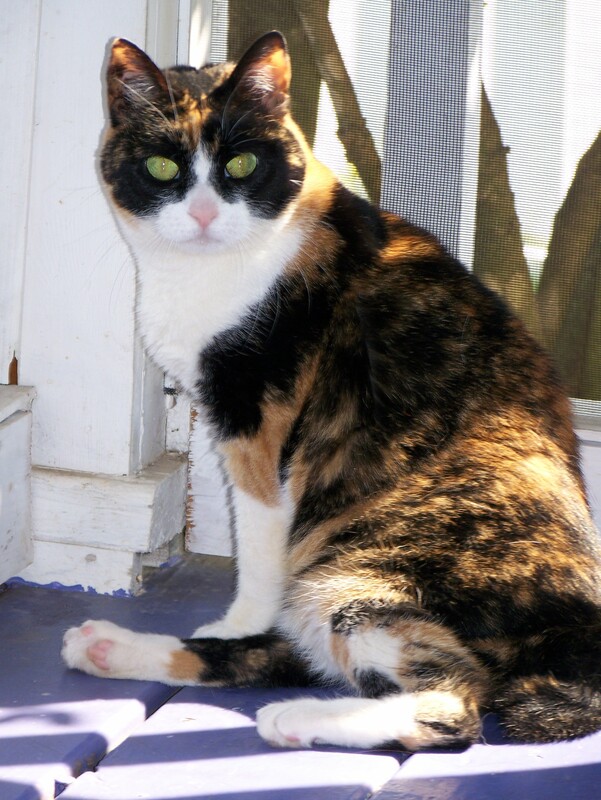 She could climb stairs, get up on furniture, even jump out the window onto the screen porch. If you are willing to give a special needs kitty a chance, just know that they will need some unique accommodations. With a little ingenuity and creativity you can give them a chance at an amazing life.